This four-drawer media chest embellishes typical Mission styling with framed drawer fronts that showcase raised wood, lattice moldings. 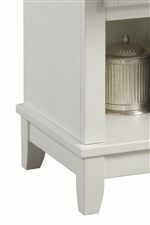 The chest is constructed from Asian hardwood solids, Mahogany solids and engineered woods with square hardware, and is available in White and Ebony (not pictured) finishes. 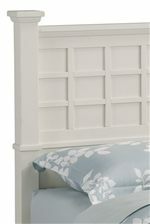 The simplistic yet detailed design of this media chest makes it an ideal piece for any bedroom setting. Offering four drawers total, the top storage drawer is lined with black felt. Additionally, an open shelf located at the case top allows for open ventilation storage of electronics and media players. The Arts and Crafts Four-Drawer Media Chest with Component Storage Shelf by Home Styles at AHFA in the area. Product availability may vary. Contact us for the most current availability on this product.